Sonny is best known for the “Phil Ochs Song Nights” and organizing events that preserve the music of her late brother, Phil Ochs, whose songs of protest galvanized activists in the 1 960’s. Her devoted efforts have helped keep this music alive to inspire us in the daunting years to come. 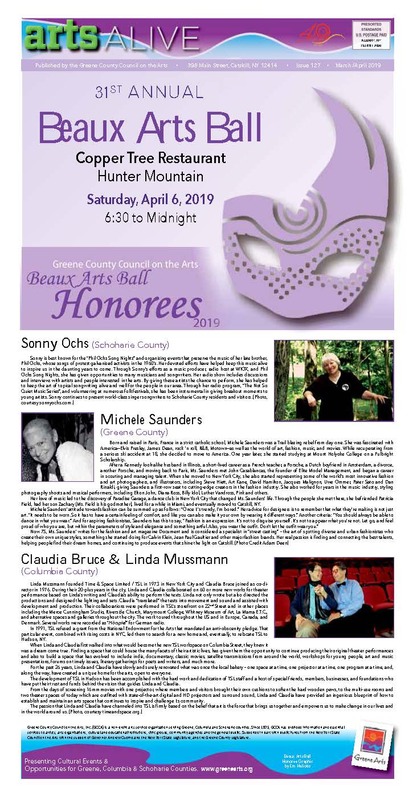 Through Sonny’sefforts as a music producer, radio host at WIOX, and Phil Ochs Song Nights, she has given opportunities to many musicians and songwriters. Her radio show ncludes discussions and interviews with artists and people interested in the arts. By giving these artists the chance to perform, she has helped to keep the art of topical songwriting alive and well for the people in our area. Through her radio program, “The Not So Quiet Music Series”, and volunteering at numerous folk festivals, she has been instrumental in giving breakout moments to young artists. Sonny continues to present world-class singer songwriters to Schoharie County residents and visitors. Linda Mussmann founded TSL in 1 973 in New York City and Claudia Bruce joined as co-director in 1 97 6. In 1 991, TSL refused a grant from the National Endowment for the Arts that mandated an anti-obscenity pledge. This, combined with rising costs in NYC led TSL to relocate to Hudson, NY. When Claudia and Linda first walked into what would become the new TSL building on Columbia Street (formerly known as Diamond Street in its seedy hey day) in Hudson, they knew it was a dream come true – finding an art space that could be ever evolving. Over two decades, Linda and Claudia have slowly and surely renovated the old bakery, one space at a time, one projector at a time, one program at a time, as they have developed a unique home for the arts, open to everyone. This has been accomplished with the hard work and dedication of TSL staff, and a host of special friends, members, busi­ nesses and foundations who have put their trust and funds behind the TSL idea. From the days of screening 1 6mm movies, where members and visitors brought their own cushions to soften the hard wooden pews, to the two theaters of today, each outfitted with state-of-the-art digital and HD projectors and Dolby surround sound, TSL’s passion is the belief that art is the force that brings us together and empowers us to make change in our lives and in the world around us. 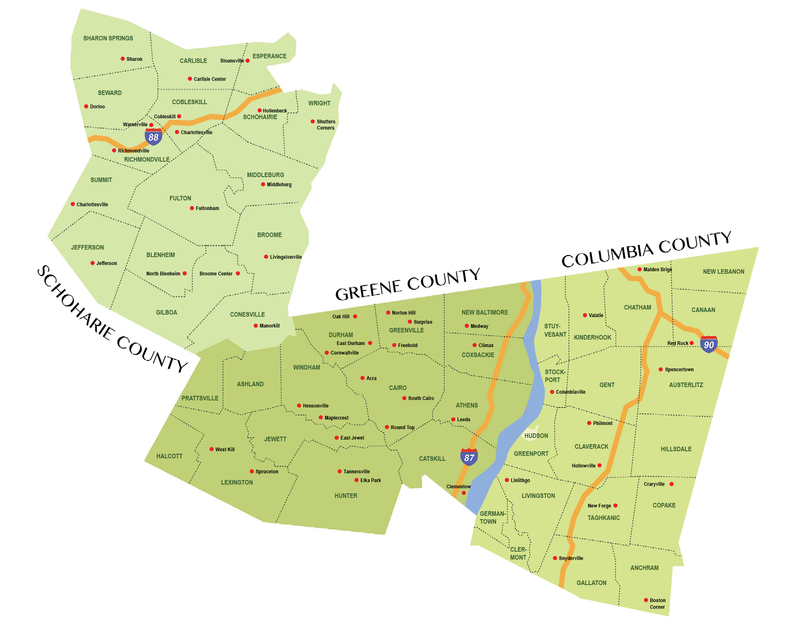 Greene County Council on the Arts, Inc. (GCCA) is a non-profit arts service organization serving Greene, Columbia andSchoharie counties. Since 1975, GCCA has provided information and essential services to artists, arts organizations, cultural and educational institutions, civic groups, community agencies and the general public. Supported in part with public funds from the New York State Council on the Arts with the support of Governor Andrew Cuomo and the New York State Legislature, and the Greene County Legislature. Nina Matis and Alan Gosule.